We're still experimenting with low-carb, tomato-rich recipes, and this one seems like it's a keeper. 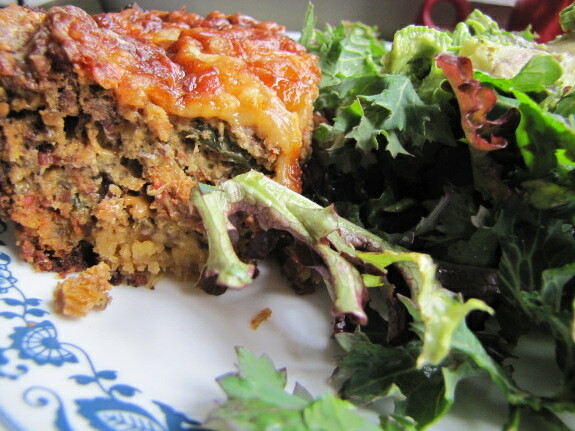 A bit like a mix between quiche and lasagna, it's won the approval of both Mark and B.J. so far, mostly because I called it a "tomato pie". Three hours before you want to eat, soak your dried tomatoes in water to plump them up. Go away for two hours, then start with the crust. Mix the crust ingredients in the food processor, then pat into the bottom of a greased pie pan. Bake at 350 degrees for about 10 minutes, until cooked but not browned. Meanwhile, bake the bacon on a cookie sheet. Discard the grease, then crumble the bacon into a bowl. Pour the water off the tomatoes and cut them up. (I used a food processor.) Then add the tomatoes to the bacon along with the eggs, yogurt, Egyptian onion tops (cut into small pieces), pesto, Hollywood sun-dried tomatoes, salt, pepper, and half a cup of the mozarella cheese. Pour the mixture into the crust and bake at 350 degrees until the eggs set (with the time depending on the size and depth of your dish). Then spread the rest of the mozarella and parmesan on top and continue baking until the cheese is brown (about 10 minutes). The Avian Aqua Miser keeps hens healthy so you have more homegrown eggs for recipes like this. This looks good, but I think it is funny you made optional the tomatoes! I think I am making this for dinner tonight. Looks amazing.